Bankemper, Joan. “Frozen Motion Scene: In Logical Methods.” High Performance. (Spring Summer 1982): pp. 60, 179. Dragone, Piergiorgio. Palimpsest. Torino: Associazione Culturale, 1988. Politi, Giancarlo. Flash Art. No. 144, (Giugno 1988): p. 69. Candau, Antoine. All Quiet on the Western Front. Paris, Roques and Fils, 1990. Leopizzi, Trizianna. “Joan Bankemper,” Next. Anno VIII- N. 22, (Auttono 1991): p. 118. Arning, Bill. White Columns Update 1992. New York, White Columns, 1992. Kahn, Robin. Promotional Copy. New York, Anti-Copyright. 1993. Morin, France. Intoxication or the Echo of One Hand Clapping. New York: New Museum, 1993. Raynar, Vivian. “Examining Cultural Mores in Lehman College Exhibition.” The New York Times, New York, NY. (5/22/1994): Weekend, Art Section. Smith, Roberta. “Anchor and Balm for Restless Souls,” The New York Times, New York, NY.(8/4/95). “Brooklyn Bridge Anchorage,” New York Magazine. (September 4th, 1995). Kahn, Robin. Time Capsule. New York, Creative Time incorporation with SOS Int’l, 1995. Berthold, Eric, A. “Art Forum.” Food and Wine. (January, 1996). p. 12. Levin, Kim. “Joan Bankemper/Suzanne Joelson,” The Village Voice, New York, NY. (1996). Valenza, Emilia. Riedificata Fabbrica. Palermo: University di Palermo, 1997. Bankemper, Joan. “Rooftop Refuge in the Asphalt Jungle.” Kitchen Garden. No. 10, (September 1997): pp. 4, 24, 25, 26, 27. Hixson, Kathryn. Joan Bankemper (98.2). San Antonio, Artpace, 1998. Goddard, Dan. “From ‘Psycho’ to Sunflowers.” San Antonio Express-News, San Antonio, TX. (July 5,1998). http://greenmuseum.org. Sophie’s Garden, Artpace Rooftop, San Antonio, TX, 1998. Medicinal Garden, Art in the Anchorage, Brooklyn NY, 1995. 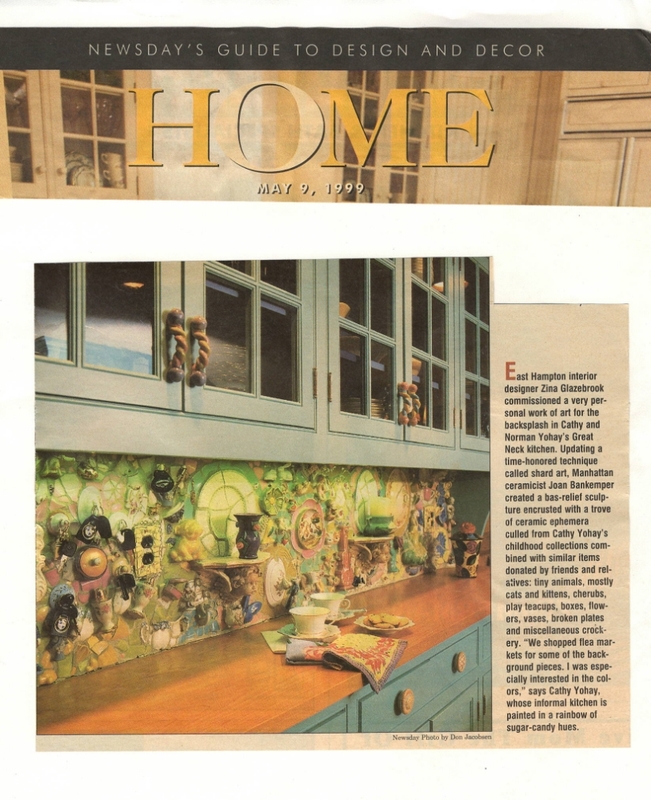 “Newsday Guide to Design and Decor, Home,” Newsday. May 9, 1999. Gross, Jennifer. Joan Bankemper. Boston: Isabella Stewart Gardner Museum, 2000. “Sugarman Foundation gives First Grants.” Art in America. (Feb. 2002). “Artist, Museums and Communities.” Pew Charitable Trust program for Art Museums and Communities. (April 7-8, 2000): pp. 19, 60-66. Temin, Christine. “How does the Gardner Grow.” The Boston Globe, Boston, MA. July 14, 2000): p. D1, D12. http://www.gardnermuseum.org. (June 16, 2000) “Joan Bankemper: A gardner’s Diary. “Joan Bankemper,” Contact. Maryland Institute of Art, (Fall 2000). Hopkins, Randi. 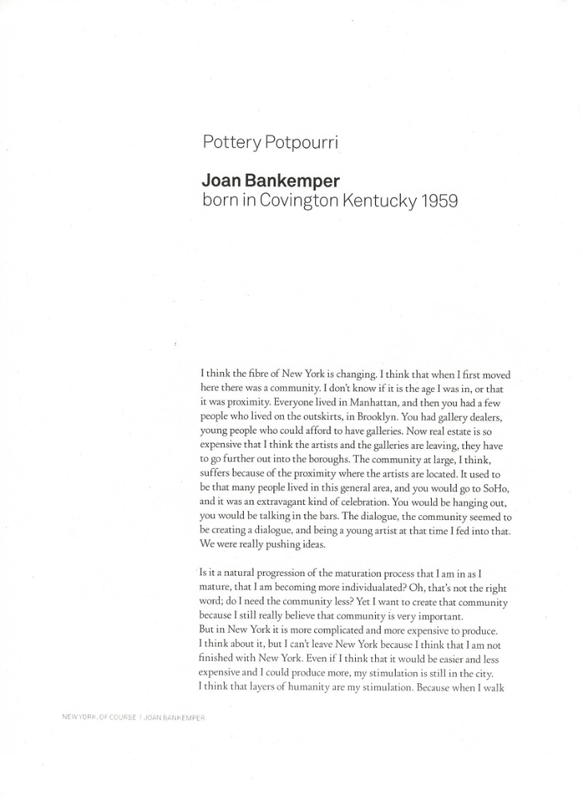 “Joan Bankemper: A Gardners Diary.” The Boston Phoenix, Boston, MA (July 6-13, 2000). “Isabella Museum/In the Garden/For the People.” The Beacon Hill/Back Bay Chronicle, Boston, MA. (June 20, 2000). Bankemper, Joan. “The Power of Beauty of Plants-Joan Bankemper Garden Project.” An Artist in Residence/School Program. (1999-2000): p. 26. “Cultivating Talent,” New York Magazine. (May 28, 2001) p. 120. Mashal,Richard. 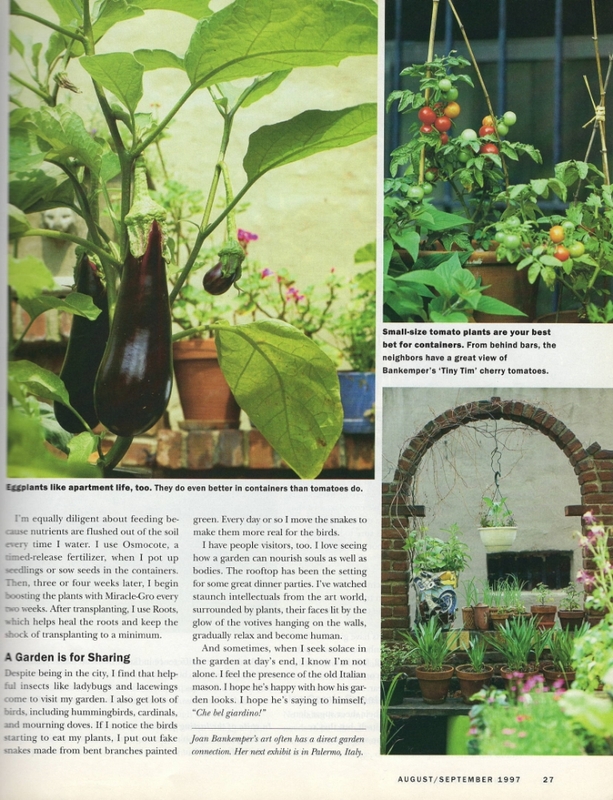 “Nature inspires Gardener-Artist Bankemper.” The Charlotte Observer, (April 25, 2003): p. 22. Lipton, Amy. Inside / Outside Passages. Jenkintown: Abington Art Center, 2005. Belanger, Marion. (Re)-Creation. Guilford: Guilford Art Center, 2005. Kenny, William. “More than just a Pretty Face.” Northeast Times, Philadelphia, PA. (November 17, 2005) p. 56. Donohoe, Victoria. “Modern meets Back to Nature.” The Philadelphia Inquirer, Philadelphia, PA. (July 12, 2005). Sozanski, Edward. 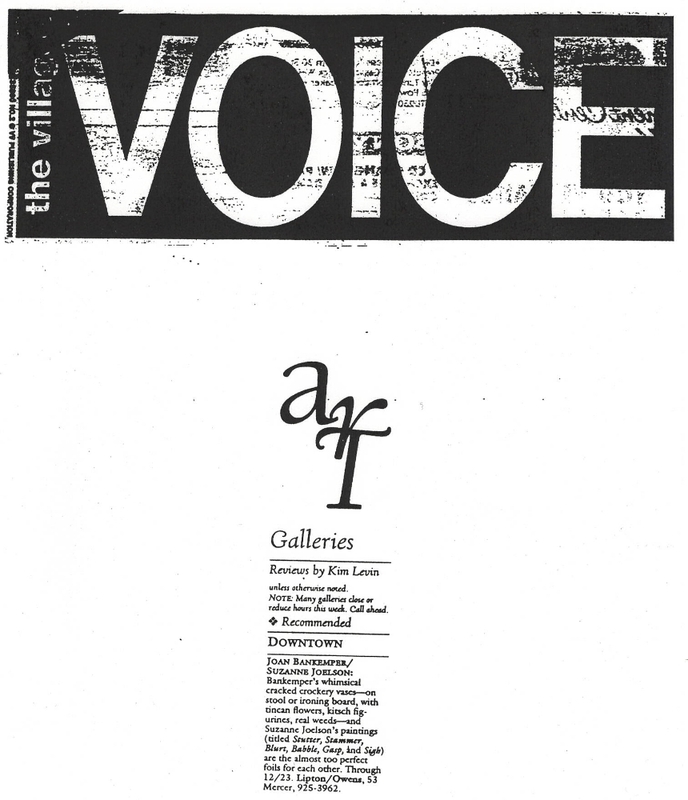 “Art meets Nature.” The Philadelphia Inquirer, Philadelphia, PA, (August 12, 2005): Weekend p. 30. Tomlin, Jimmy. “Inner-City Haven.” Our State North Carolina. (April 2006): pp. 156, 157, 158, 160. McGregor, Jennifer. Garden Improvement. Bronx: Wave Hill, 2006. Herrmanns, Ralph. New York, of Course. Stockholm, Wettering Gallery, 2007. “Express Lane Blanc Statement.” Time Out. (April 5-11, 2007): p. 48. Druckman, Charlotte. “Playing House.” New Your Times. Design and Living (Winter 2007): p. 32. Boekeiheide, Don. “Public Housing and Community Gardens.” donboekeide.com, May 30th, 2007. “Kiln Joy,” Blueprint. Issue No. 6, (September/October 2007) p. 41. Lipton, Amy. “Artist Create Edible Gardens.” Ecoartspace.blogspot.com (August 21, 2009). Gookin, Kirby. “History of Creative Time,” creative time.org/programs/archive/2009.../CT-history.pdf. “The Gabi Award,” (02/22 2010), http//mccollcenter.org/blog/view/37/the-gabi-award. Lovelace, Joyce. “Happenings,” American Craft Council Magazine. (June/July 2010). Fensom, Sarah. “Celestial Ceramic.” Art and Antiques. (March 2011) p.18. Lipton, Amy. “‘The ‘Farm Project’ at Saunders Farm,” Philipstown, Philipstown, NY. (September 24, 2011). Petry, Michael. Nature Morte. New York, Thames and Hudson, 2013. Washington Post, Washington, D.C. (July 26th, 2014). Shawn, Sullivan. “Park the Cars in an Art Gallery.” ofi blog, smithsonianofi.com. (August 15th, 2014). Bankemper, Joan. A Good Run: 1983-1990. New York, Paris, Turin, Edgewise Press, 2016.